In this tutorial, we will show how to use s3cmd to set up an incremental backup for all your WordPress site hosted on a VPS server. 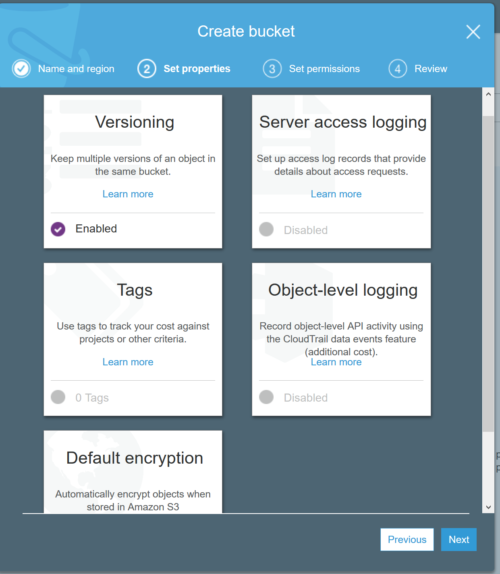 We will be backing up the WordPressfiles to Amazon s3. Once python is installed, go to GitHub repo of s3cmd, and copy the latest release URL, replace the URL with wget command below. After download of the s3cmd source is complete, run the following set of commands to setup it up. Now, s3cmd is set up on your VPS server, run the following command to configure it. You will need your s3 Access Key and Secret Key, you can get it from 'Security Credentials' section on the S3 console. If we are using IN as the region then use 's3.ap-south-1.amazonaws.com' as the base URL. We have now configured the first piece of our backup strategy. 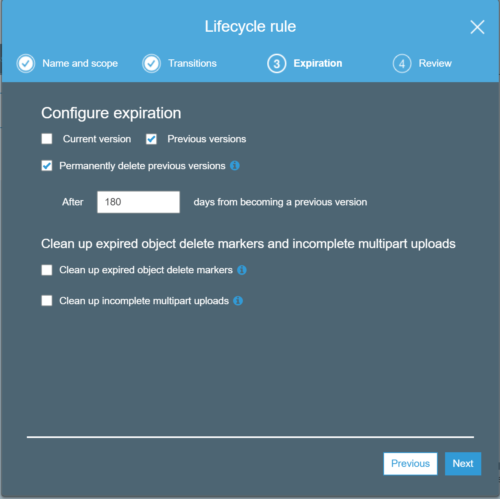 Got to your S3 console and create a bucket where you want to keep your backup files. The only thing to remember when you are creating the bucket is to enable the versioning. This will ensure that you have backups of the files that are deleted on the server when you need it. 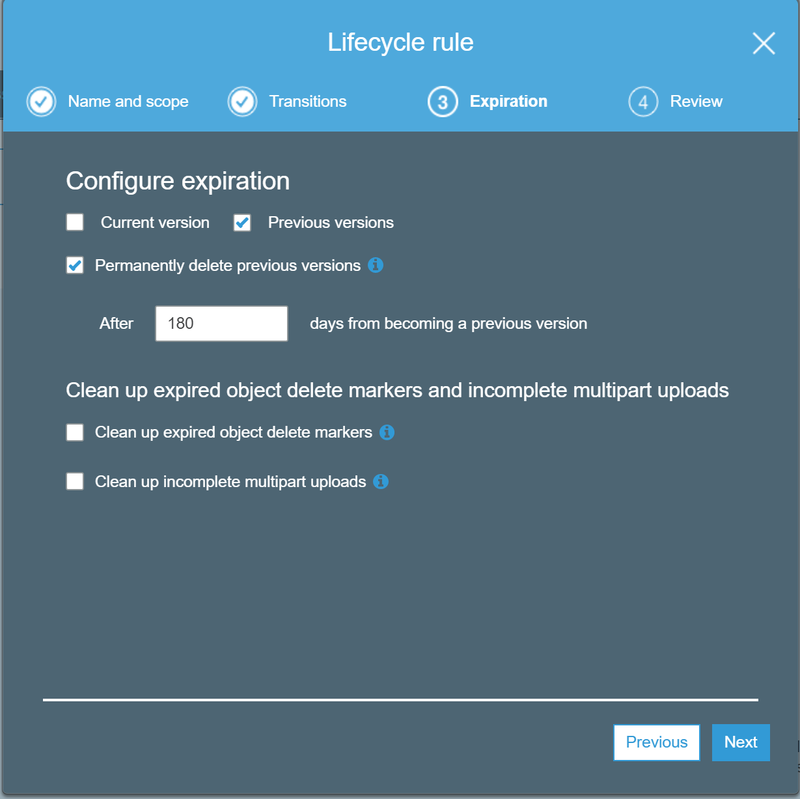 Also, we will need to set up a lifecycle rule to delete the old version of files. I prefer to delete them after 180 days. See the image below to get an idea. We have now configured the s3cmd and we have also set up the S3 bucket we need to keep the backups, now lets set up the backup shell script. This is needed to send simple email after s3 file sync . Create backup.sh file in /usr/local/sbin directory on VPS. Put the following code in the newly created backup.sh file. In the script, you will need to setup few variables to make it work for you. In this script, we have assumed that database name and folder follow a similar naming convention. S3DIR: is the S3 bucket path from which backup will be stored. MYSQL_USER: name of the mysql user with enough privileges to take the dump of the database. MYSQL_PASS: password of the user specified above. Now if you run the backup.sh script it will take the database dump of all the databases and sync the files to your s3. A good backup strategy for a WordPress site does not just depend on the manual backups but schedules auto backups, and for that, we need to setup cron. Depending on your needs you can set up an hourly, daily, weekly or monthly backups. below are the cron commands you will need. This will run our backup script every hour. This will run every week on Sunday at midnight. You can change both the time and day of the week for backup. If you need to change the schedule, check out more crontab examples.